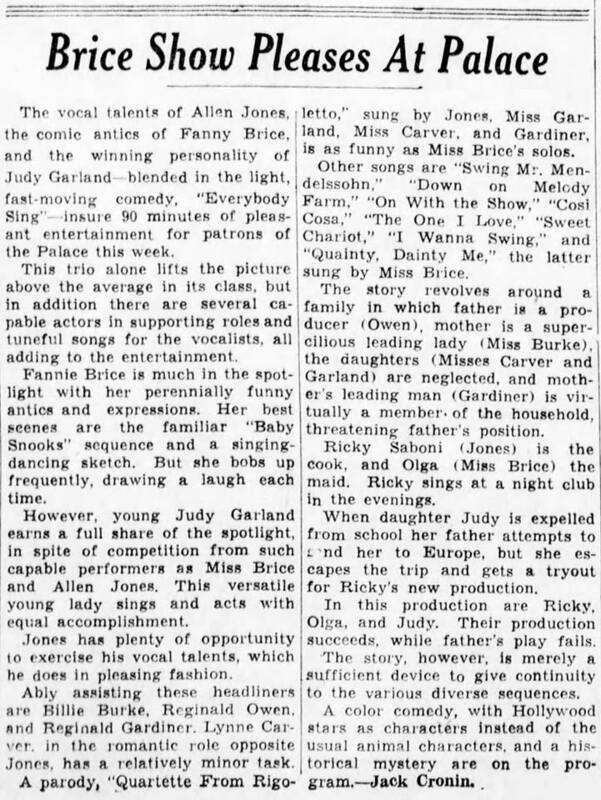 February 12, 1938: “Everybody Sing” is still playing to great business and good reviews, including this one by Harold W. Cohen, was published in the Pittsburgh Post Gazette (text below) and another by Jack Cronin for the Cincinnati Enquirer. 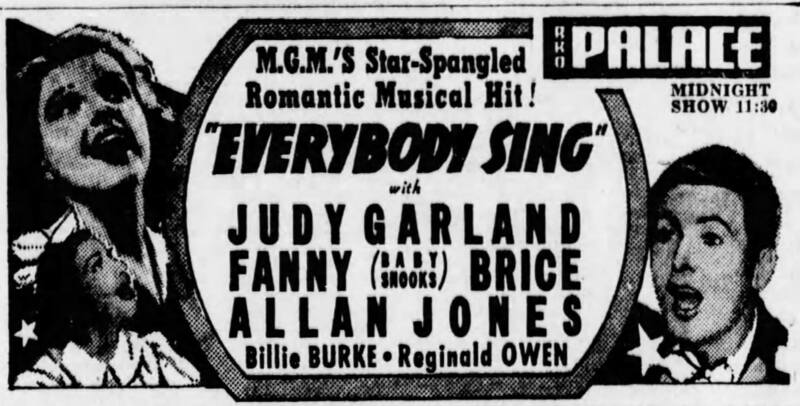 In “Everybody Sing,” everybody does, that Benny Goodman version of Deanna Durbin, little Judy Garland; the celebrated Baby Snooks, in private and public life, too, Miss Fannie [sic] Brice; good-looking, pleasantly self-conscious Mr. Allan Jones and wry, witty English Reginald Gardiner. What’s more, their repertoire is first-rate, their behavior capital and their picture excellent. They are all talented, attractive people and “Everybody Sing” Kees them signing merrily at their work. Vocal specialties spill in profusion from the featherweight plot, lively comedy peeks from every corner and the whole things is a triumph of fitting material to the contract list. It is a triumph as well for Miss Garland, the answer to a songwriter’s prayer. An enormously gifted youngster with an adult approach to any given set of lyrics, she makes every tune seem practically momentous, swings her slight, lithe frame in syncopated jig-time and scorches the screen with her rhythmic bleatings. If Sophie Tucker was the last of the old red-hot mamas, then Miss Garland is certainly the first of the new ones. 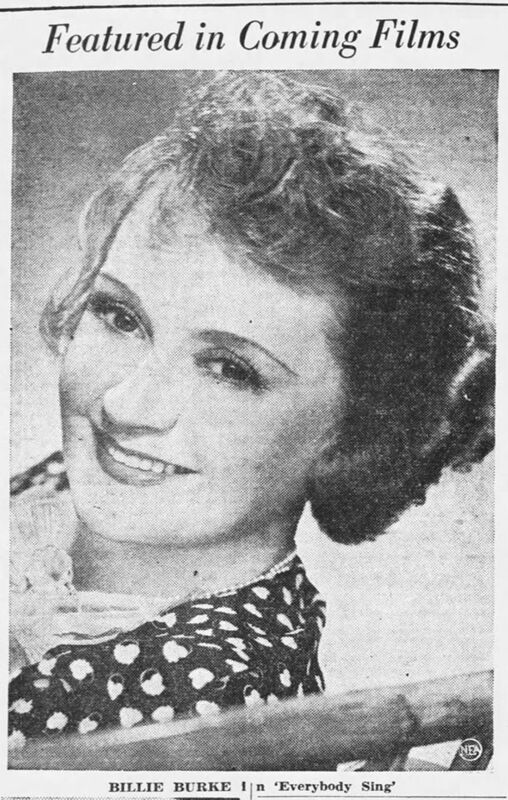 For story purposes, she is the daughter of Reginald Owen, a wild-eyed, hair-tearing playwright, and Billie Burke, a scatter-brained actress with a hard of ham. When the family’s treasury runs dry and their backer out, Miss Garland, just expelled from school because she simply couldn’t help swinging Mendelssohn’s Spring Song, decides it’s up to her to resurrect the domestic ruins. She turns the trick via the customary Broadway musical, staged by Mr. Jones, the households’ ex-cook, and featuring at the last minute Miss Brice, the mugging maid. “Everybody Sing” is a happy re-introduction to the cinema for Miss Brice. In her one previous adventure in Hollywood, somebody had the bright (oser) idea of converting the lady into a tragedienne and the results, if they weren’t exactly appalling, were at least distressing. Here, however, she is strictly cap and bells and there isn’t a better, more devastating clown this side of the Bronx. Miss Brice’s “Quainty, Dainty Me” – it comes out of her mouth “kvainty, denty me” – is positively priceless and so is her Baby Snooks duet with Miss Garland. Between them, Miss Brice and her adolescent co-star alone would be enough to make “Everybody Sing” self-sustaining. 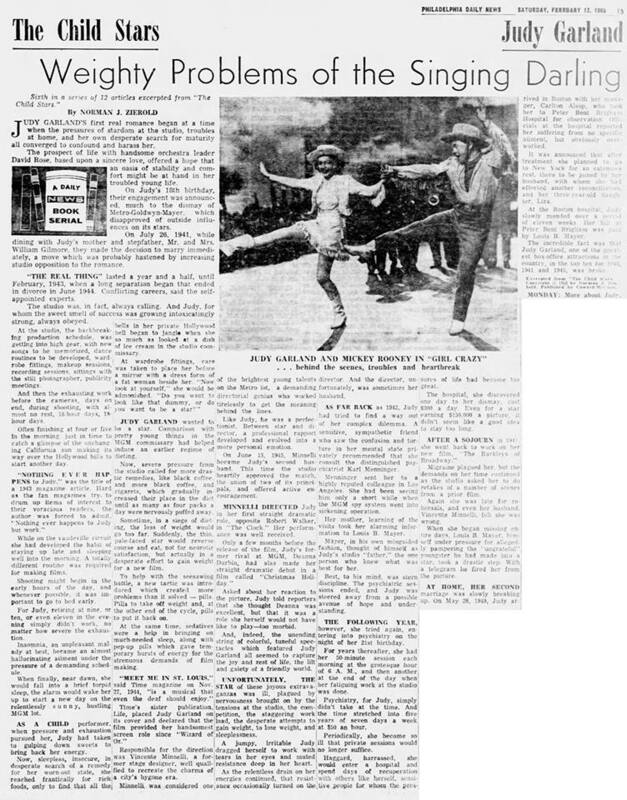 But the picture has even more – for instance, that hilarious burlesque of the quartette from “Rigoletto,” in which Mr. Jones, Mr. Gardiner and pretty Lynne Carver (the romantic interest) also participate; Miss Burkes hilarious phone conversation o with Miss Colvin of the Colvin School for girls, and Mr. Gardiner’s make-believe Benny Goodmaning with a walking stick aboard a Chinatown bus. So set it down as slight but completely winning entertainment and chalk up two more departmental favorites in Miss Garland and Miss Brice. They have what it takes to make you forget that March 15 (income tax, remember?) is just around the corner. February 12, 1943: Filming continued on Girl Crazy, on the “Exterior Western Street” which was on MGM’s Backlot #3’s “Western Street.” Time called: 9 a.m.; dismissed: 4:30 p.m.
February 12, 1945: Rehearsals for The Harvey Girls included the “Round and Round” and “Hayride” numbers. “Hayride” was cut from the film, but the audio survives and has been released on both laserdisc and CD. Time called: 2 p.m.; Judy arrived on set at 1:55 p.m.; company dismissed at 4:50 p.m.
Also included above, Walter Winchell on Broadway. The tune for the song was reworked with new lyrics and used in 1950’s Pagan Love Song. Below, our friend Mark compares the two. Thanks, Mark! 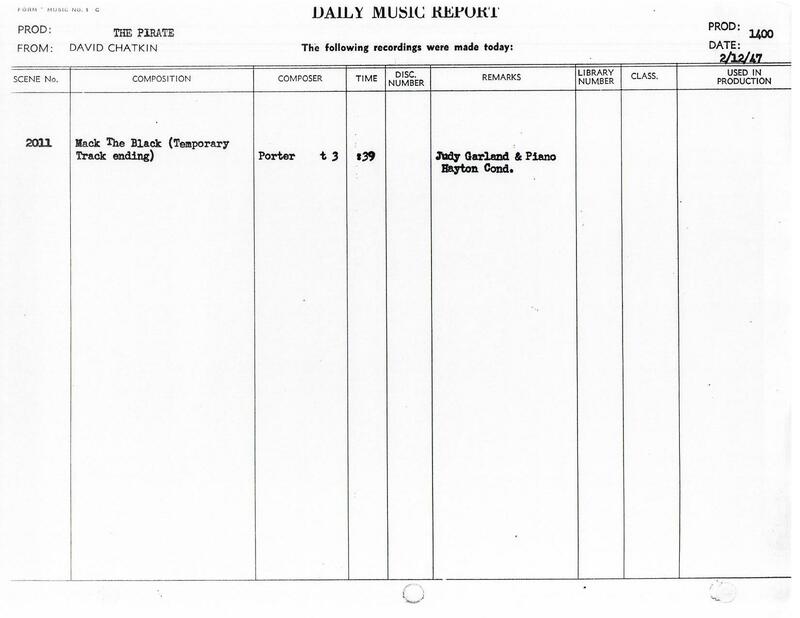 February 12, 1947: Judy was in the MGM recording studio, very briefly, recording a “temporary track ending” for the song “Mack the Black” for The Pirate. This 39-second recording is not known to exist. 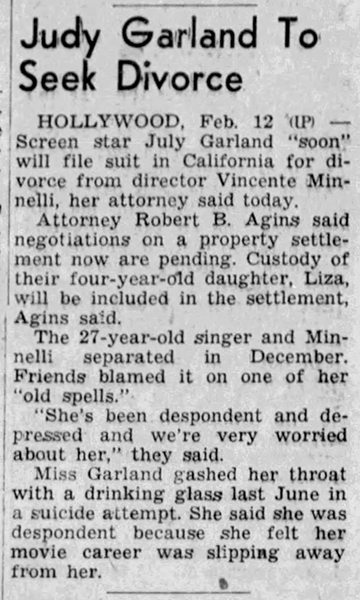 February 12, 1951: Judy filed for divorce from second husband Vincente Minnelli. The couple had legally separated in early December 1950. February 12, 1954: Filming continued on the “Someone At Last” number on the “Interior Malibu House” set for A Star Is Born. Time called: 10:00 a.m.; finished: 6:00 p.m.
Photo taken by Bob Willoughby provided by Kim Lundgreen. Thanks, Kim! 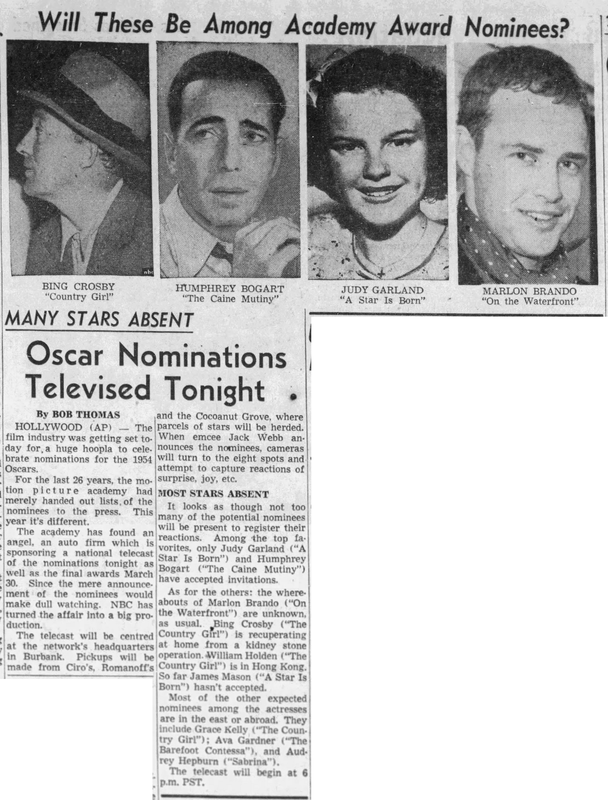 February 12, 1955: The Oscar nominations for 1954 were announced live on TV for the first time, from the NBC Studios in Burbank, California. It was no surprise that Judy was nominated for Best Actress for her role in A Star Is Born. 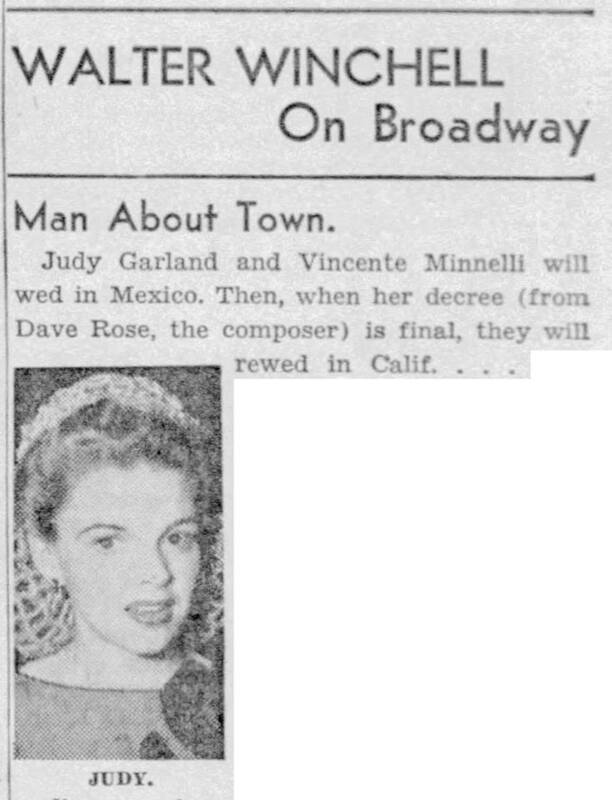 Note that in the clipping above, the newspaper inexplicably chose to use a photo of Judy from almost 20 years prior. A very pregnant Judy was at the NBC Studios for the announcement along with husband Sid Luft. In the photos below she’s seen with Jane Wyman, June Allyson, Greer Garson, Jack Webb, Humphrey Bogart, and Lauren Bacall (from behind). February 12, 1959: Judy and husband Sid Luft were recently photographed at New York’s Grand Central Station. The couple was on their way to Florida for a vacation. 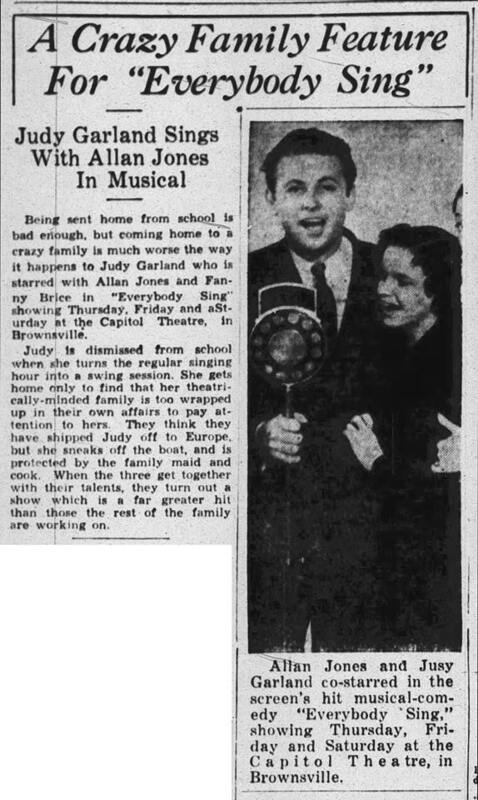 February 12, 1961: In his column, Tom Reedy reported that Judy had found happiness in London, England. 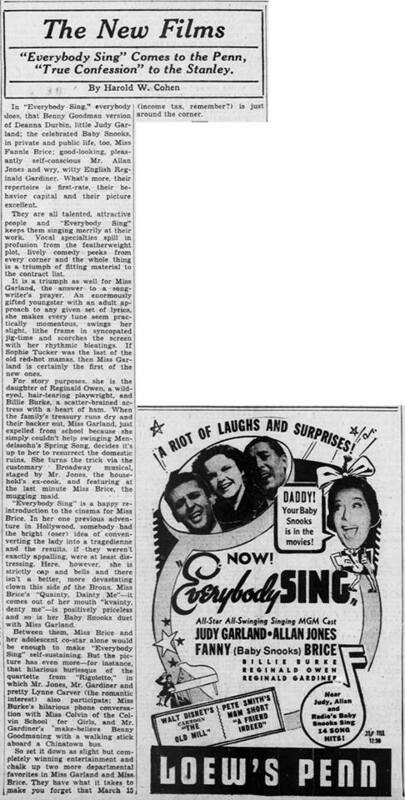 February 12, 1962: In Steven H. Scheuer’s syndicated Q&A column, “TV Key Mailbag,” a reader asked if it was true that TV producers wouldn’t hire Judy due to her weight issues. Scheuer gave “Mrs. R.G.” the correct answer. 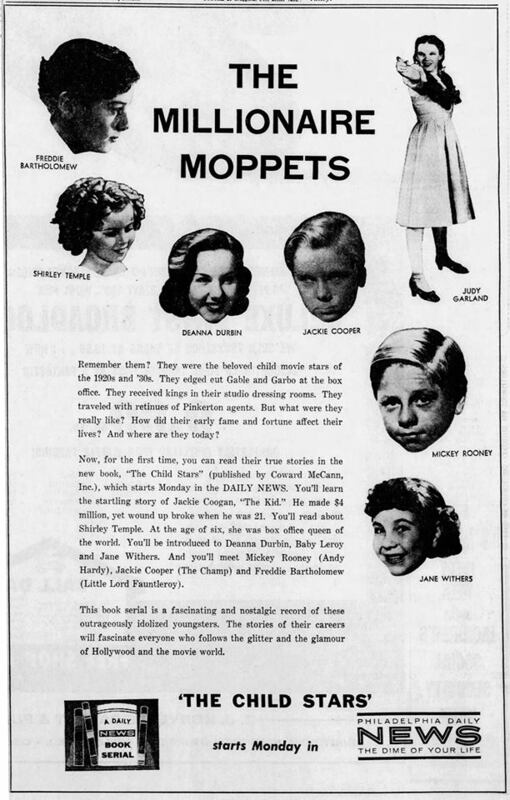 February 12, 1966: The sixth installment of a 12 installment series of articles about “The Child Stars” of the 20s and 30s. Judy was given two installments, this one and #7 published the next day. JUDY GARLAND’S first real romance began at a time when the pressures of stardom at the studio, troubles at home, and her own desperate search for maturity all converged to confound and harass her. The prospect of life with handsome orchestra leader David Rose, based upon a sincere love, offered a hope that an oasis of stability and comfort might be at hand in her troubled young life. 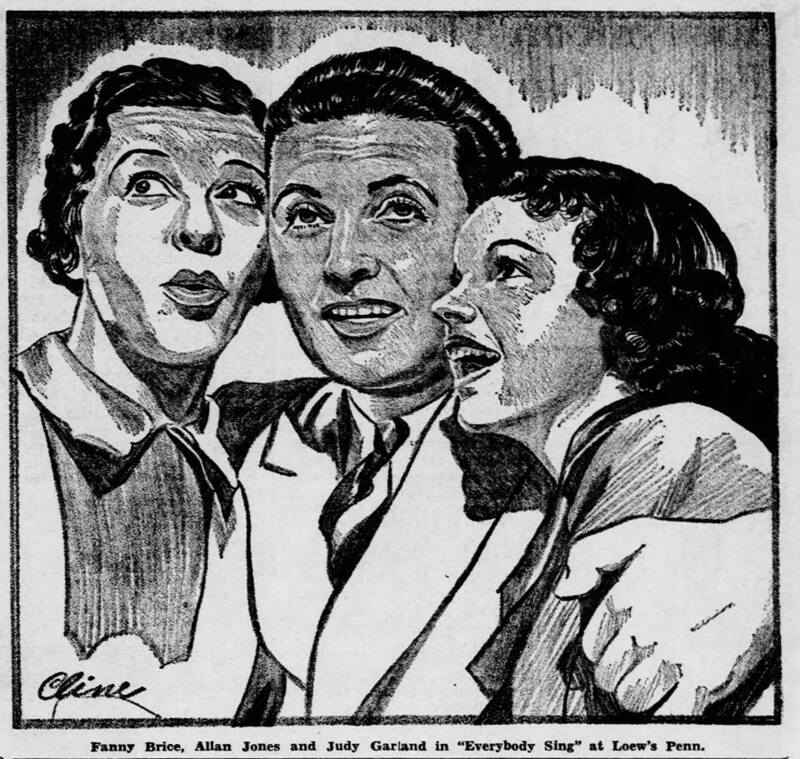 On Judy’s 18th birthday, their engagement was announced, much to the dismay of Metro-Goldwyn-Mayer, which disapproved of outside influences of its stars. On July 26, 1941, while dining with Judy’s mother and stepfather, Mr. and Mrs. William Gilmore, they made the decision to marry immediately, a move which was probably hastened by increasing studio opposition to the romance. “THE REAL THING” lasted a year and a half, until February 1943, when a long separation began that ended in divorce in June 1944. Conflicting careers said the self-appointed experts. The studio was, in fact, always calling. And Judy, for whom the sweet smell of success was growing intoxicatingly strong, always obeyed. At the studio, the backbreaking production schedule was getting into high gear, with new songs to be memorized, dance routines to be developed, wardrobe fittings, makeup sessions, recording sessions, sittings with the still photographer, publicity meetings. And then the exhausting work before the cameras, days on end, during shooting, with almost no rest, 16-hour days, 18-hour days. Often finishing at four or five in the morning just in time to catch a glimpse of the unchanging California sun ambit its way over the Hollywood hills to start another day. While on the vaudeville circuit she had developed the habit of staying up late and sleeping well into the morning. A totally different routine was required for making films. Shooting might begin in the early hours of the day, and whenever possible, it was important to go to bed early. For Judy, retiring at nine, or ten, or even eleven in the evening simply didn’t work, no matter how severe the exhaustion. Insomnia, an unpleasant malady at best, became an almost hallucinating ailment under the pressure of a demanding studio. When finally, near dawn, she would fall into. Brief torpid sleep, the alarm would wake her up to start a new day on the relentlessly, sunny, bustling MGM lot. AS A CHILD performer, when pressure and exhaustion pursued her, Judy had taken to gulping down sweets to bring back her energy. Now, sleepless, insecure, in desperate search for a remedy for her wont-out state, she reached frantically for rich foods, only to find that all the bells in her private Hollywood hell began to jangle when she so much as looked at a dish of ice cream in the studio commissary. JUDY GARLAND wanted to be a star. Comparisons with pretty young things in the MGM commissary had helped induce an earlier regime of dieting. Now, severe pressure from the studio called for more drastic remedies, like black coffee, and more black coffee, and cigarets, which gradually increased their place in the diet until as many as four packs a day were nervously puffed away. Sometime, in the siege of dieting, the loss of wright would go too far. Suddenly, the thin pale-faced star would reverse course and eat, not for neurotic satisfaction, but actually in a desperate effort to gain weight for a new film. To help with the seesawing battle, a new tactic was introduced which created more problems than it solved – pills. Pills to take off weight and, at the other end of the cycle, pills to put it back on. At the same time, sedatives were a help in bringing on much-needed sleep, along with help-up pills which gave temporary bursts of energy for the strenuous demands of film making. Responsible for the direction was Vincente Minnelli, a former stage designer, well qualified to recreate the charms of a city’s bygone ear. Minnelli was considered one of the brightest young talents on the Metro lot, a demanding directorial genius who worked tirelessly to get the meaning behind the lines. Like Judy, he was a perfectionist. Between star and director, a professional rapport developed and evolved into a more personal emotion. 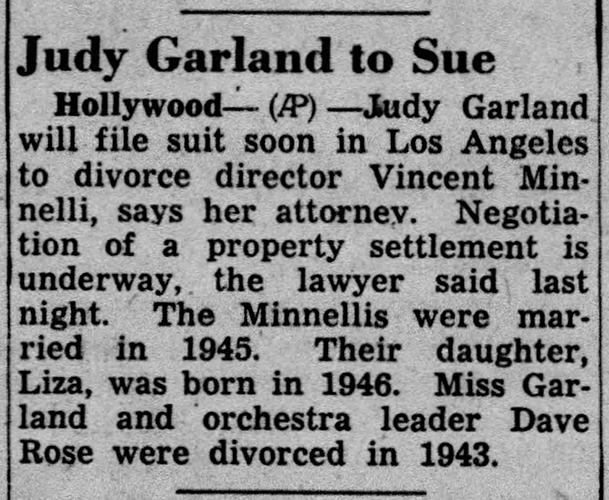 On June 15, 1945, Minnelli became Judy’s second husband. This time the studio heartily approved the match, the union of two of its principals, and offered active encouragement. MINNELLI DIRECTED Judy in her first straight dramatic role, opposite Robert Walker, in “The Clock.” Her performance was well received. Asked about her reaction to the picture, Judy told reporters she thought Deanna was excellent, but that it was a role she herself would not have like [sic] to play – too morbid. 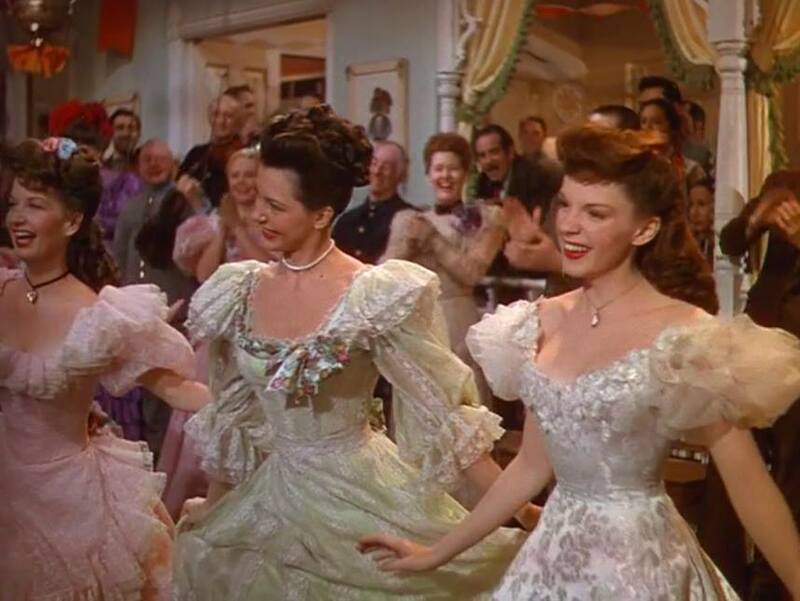 And, indeed, the unending string of colorful, tuneful spectacles which featured Judy Garland all seemed to capture the joy and zest of life, the lilt and gaiety of a friendly world. UNFORTUNATELY, THE STAR of these joyous extravaganzas was ill, plagued by nervousness brought on by the tensions at the studio, the competition, the staggering workload, the desperate attempts to gain weight, to lose weight, and sleeplessness. A jumpy, irritable Judy dragged herself to work with tears in her eyes and muted resistance deep in her heart. As the relentless drain on her energies continued, that resistance occasionally turned on the director. And the director, unfortunately, was sometimes her husband. AS FAR BACK as 1942, Judy had tried to find a way out of her complex dilemma. A sensitive, sympathetic friend who saw the confusion and torture in her mental state privately recommended that she consult the distinguished psychiatrist Karl Menninger. Menninger sent her to a highly reputed colleague in Los Angeles. She had been seeing him only a short while when the MGM spy system went into sickening operation. Her mother, learning of the visits, took her alarming information to Louis B. Mayer. Mayer, in his own misguided fashion, thought of himself as Judy’s studio “father,” the one person who knew what was best for her. Best, to his mind, was stern discipline. The psychiatric sessions ended, and Judy was steered away from a possible avenue of hope and understanding. THE FOLLOWING YEAR, however, she tried again, entered into psychiatry on the night of her 21st birthday. For years thereafter, she had her 50-minute session each morning at the grotesque hour of 6 A.M. and then another at the end of the day when her fatiguing work at the studio was done. Psychiatry, for Judy, simply didn’t take at the time. And the time stretched into five years of seven days a week at $50 an hour. Periodically, she became so ill that private sessions would no longer suffice. Haggard, harassed, she would enter a hospital and spend days of recuperation with others like herself, sensitive people for whom the pressures of life had become too great. The hospital, she discovered one day to her dismay, cost $300 a day. Even for a star earning $150,000 a picture, it didn’t seem like a good idea to stay too long. Migraines plagued her, but the demands on her time continued as the studio asked her to do retakes of a number of scenes from a prior film. Again she was late for rehearsals, and even her husband, Vincente Minnelli, felt she was wrong. When she began missing entire days, Louis B. Mayer himself under pressure for allegedly pampering the “ungrateful” youngster he had made into a star took a drastic step. With a telegram, he fired her from the picture. AT HOME, HER SECOND marriage was slowly breaking up. On May 28, 1949, Judy arrived in Boston with her manager, Carlton Alsop, who took her to Peter Bent Bringham Hospital for observation. Officials at the hospital reported her suffering from no specific ailment, but obviously overworked. It was announced that after treatment she planned to go to New York for an extended rest, there to be joined by her husband, with whom she had affected another reconciliation, and her three-year-old daughter, Liza. At the Boston hospital, Judy slowly mended over a period of eleven weeks. Her bill at Peter Bent Bringham was paid by Louis B. Mayer. The incredible fact was that Judy Garland, one of the greatest box-office attractions in the country, in the top ten for 1940, 1941 and 1945, was broke. February 12, 1967: The 9th airing of The Wizard of Oz on network TV. It was also the end of the film’s run on CBS, whose contract with MGM to air the film annually had expired. It was then shown annually on NBC until 1976 when it moved back to CBS where it stayed until it aired on the WB Network in 2002 (which was the first broadcast showing since the last CBS airing on May 8, 1998). It was then shown on the WB Network for four years in addition to the cable showings which began on the Turner Classic Movies (TCM) channel on November 21, 1999. It has since been shown on (usually more than once a year) on TCM, TNT (Turner Network Television), and TBS (Turner Broadcasting System), all three are owned by Turner Broadcasting which has retained the TV rights to the film even though it’s now owned by Warner Bros. It has been almost 66 years since the story fo the “Wizard of Oz” was first published by L. Frank Baum, and the movie, bade from the book in 1939, has been shown almost every year since then, but neither ever seem to lose their charm. It will be shown again on Sunday night on television. “The Wizard of Oz” is the first of a long line of Oz books, one of which was published each year for many years. It is the fanciful tale of the little Kansas girl, Dorothy, who with her dog, Toto, is carried by a cyclone to the marvelous Land of oz for many adventures. This first Oz book was an instant success and in addition to the Judy Garland movie, the Wizard was made into a musical comedy, a silent film, a puppet show and a radio show. It has been translated into a dozen foreign languages. The musical comedy, make from “The Wizard of Oz” in 1902, made Dave Montgomery and Fred Stone famous as the tin woodman and the scarecrow. The play ran for nearly 10 years. Copies of the first editions of the book are still in demand. An inscribed book by Baum sold for over $3,000. Frank Baum was not too successful a businessman until he started writing his Oz books. For several years he had published a newspaper in Aberdeen, S.D. where he was most unhappy, and which he left bankrupt. Later, he was a reporter in Chicago, then a traveling salesman. His first book, “Mother Goose in Prose” was illustrated by Mayfield Parrish. Later, he wrote other fairy tales and a science fiction on “The Life and Adventures of Santa Claus,” but it was not until “The Wizard” appeared that he became a success. His second book of the series, “The Marvelous Land of Oz,” was illustrated by John R. Neill, who streamlined the figures of Dorothy and her friends and who illustrated many other books in the series, and after Baum’s death, wrote several himself. Other Oz books were written by Ruth Plumly Thompson, Jack Snow, Rachel Cosgrove, Eloise McGraw and Laurie Wagner, but Baum’s own books are the best sellers. Baum wrote eight books from 1913 until his death in 1919, in addition to “The Wizard,” “The Marvelous Land of Oz,” and “Ozma of Oz,” written before 1907. He tried several times to stop the series and wrote “Queen Zixi of Iz” and the “Adventure of a Gingerbread man” and other [sic], but it as Oz the children wanted. Young readers find the Oz characters real and appealing. The notice that the scarecrow, who is looking for brains, really knows most of the answers; the “heartless” tin woodman is the kindest of all and the cowardly lion is brave despite his fears.